Nepal's Gurung Community Says Goodbye To A Trying Year : Goats and Soda Two earthquakes, a delayed constitution and unrest on the Indian border: The Year of the Monkey can't come soon enough. Anusha Gurung (left) and her friend Illa Gurung take part in a New Year's dance competition in Kathmandu, Nepal. At a New Year's celebration in Kathmandu, people are munching water buffalo dumplings and sipping moonshine while looking back on a tough year. "So many people died in the earthquake, so many houses went down," says Dil Bahadur Gurung, 45, who ran a food stall at the Lhosar festival — the name of the Tibetan New Year. "We were thinking not to celebrate this year," says Dil Bahadur, whose village home was destroyed in the earthquake and who lost five of his neighbors. "But we decided to because the government told us we have to. It brings positive energy and honors those who died." Actually, there are a lot of New Years on the Nepalese calendar. The official New Year comes in April. There are Tibetan New Year dates as well. But the dance clubs and bars of Kathmandu will be filled with revelers ushering in the Western New Year tonight. Dil Bahadur's attitude reflects the mood of the country. Twin earthquakes in April and May killed almost 10,000 and wiped out half a million homes. The passing of the country's long-delayed constitution in September should have been cause for celebration, but several groups felt left out of the fast-tracked document. This continued a series of violence that has killed over 40, including security forces and a 4-year-old child. For the past three months, unrest at the Indian border has caused an unofficial blockade and severe fuel crises, which many Nepalis believe are orchestrated by India to show political might. To top it all off, postearthquake reconstruction is painfully slow. The government has yet to release any of the $4 billion donated by the international community; in the meantime, many quake survivors are spending the Himalayan winter in tents and tin shacks. 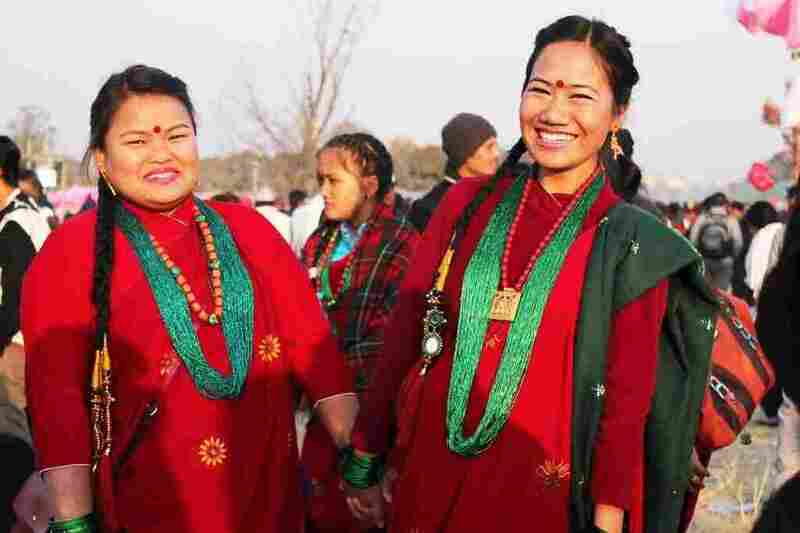 Most of the celebrants are from Kathmandu's Gurung ethnic group. They're gathering at the city's central parade grounds to bid a bittersweet goodbye to the year. The same spot hosted tents for the displaced until just a few months ago. The ground still dips from drainage canals dug by survivors. Gurungs make up about 3 percent of Nepal's population and hail from some of the most earthquake-affected regions. Predominately Buddhist, they use the same 12-year calendar common in Chinese tradition. Lhosar marks the change to a fresh (sar) year (Lho). As Gurungs ushered out the Year of the Goat, they welcomed the Year of the Monkey. Samir Gurung, 20, studies hotel management in Kathmandu and works part time at a bar in the tourist district. His family's house was destroyed in the quake, and some of his relatives died. "We lost everything: people, family, everything. But it's OK, we're happy. Next year we're going to rebuild our house. We lost everything, but still we are fine." Gauri Maya Gale, 40, worked as a subsistence farmer in her village at the earthquake's epicenter until the quake took her house and destroyed her corn and millet fields. She has been in Kathmandu since and says her family has decided to relocate permanently to the capital. "There's nothing left. Our house is gone. Our land is unrecognizable. A lot of money came from donations, but we didn't receive any. We don't have anywhere to go so we are staying in Kathmandu. Even though life was hard [in the village], it's even harder for us to survive here in Kathmandu because of the fuel crisis. In the village we were working very hard, but we didn't have to worry about where we'd eat or sleep." Alina Karki, 25, is just back in Kathmandu after eight years in London, where she finished a master's in marketing. Alina is not Gurung but is celebrating nonetheless, along with a friend. "I can realize it's getting worse because of the pollution and the political situation, and because of the Indian government we are not getting fuel or cooking gas. Many people are cooking on wood fires. All the food, clothes, transportation is getting more expensive. Before, one cup of tea cost 5 rupees (5 cents), now it's 30 to 40 (30 to 40 cents). So I don't think I should [stay in Nepal]. I really wanted to do something for our nation, but look, there's nothing here. We always have to hope positive things. Maybe we can produce our own fuel so we don't have to beg from our neighbors." Anusha Gurung, 18, came to participate in a Lhosar dance competition with her friend Illa Gurung, 22. The two will donate any prize money to an orphanage and believe it's important to do social work in their own country. "There are many problems, but also we are celebrating our culture. Despite the fuel scarcity, all these people came by foot. They could have celebrated at home, but it's better to come together. 2015 was such a bad year. We are hoping 2016 will be a good year and the suffering will end. It's my last year [in school] and I want to go abroad and study more, get a job over there. We are hoping for the best next year, but there is still fear." Dawa Gyanchen Lama, 81, retired from his work as a monk in one of Kathmandu's most prominent monasteries but still does astrology readings, which he offered to Lhosar celebrants. "Whatever happened, happened in the goat year," he says. "Next year will be good. In the book [Buddhist text] it says the goat year will be bad, so I knew it was going to be a bad year. Most of the time the goat year is bad. But the monkey year will be better."